For a brief moment I really thought that this week’s Modern Family had the potential to pull the show out of its current rut. First, there was the fact that the show had been off the air for two weeks, and you know, absence makes the heart grow fonder and all that. On top of that, a prom-centric episode seems like exactly the type of thing Modern Family excels at. I’ve said before that the show is at its best when it finds that sweet spot between being a straightforward comedy and a more touching, human sitcom. Tackling prom then seems like something right in that wheelhouse. Alas, “Promposal” continues the show’s recent streak of churning out episodes devoid of heart and lacking in a streamlined, cohesive story. Now, there are certainly portions of “Promposal” that work, but as has been the case far too often lately, those moments are lost in an episode that tries to cram in too many plots and subplots. Take, for instance, just a single plot from this week’s episode. At the beginning of the episode Gloria discovers that Auntie Alice (June Squibb) has a new type of sauce and it’s clearly Gloria’s recipe. Phil, who’s come over to the house to help her set up a website for her sauces, insists that they go down to the grocery store and confront Auntie Alice about the thievery. So, right off the bat we have a focus on the continued working relationship between Phil and Gloria plus the setup for the subplot involving a stolen recipe. The problem is, “Promposal” piles on the details after that. There’s Phil dealing with the sense that he’s not respected professionally because he was replaced at Lily’s Career Day, Gloria’s worry about how to handle Auntie Alice, and then the lying from Auntie Alice that comes after their confrontation. The subplot buckles under the weight of all the contrivances that must happen in order to get to the resolution, which sees Phil use his real estate knowledge to blackmail Auntie Alice into pulling the sauce from her line. Sure, sitcoms engage with contrivances all the time, but lately Modern Family has been using them to a degree that’s troubling. The show has always done well when steering away from more contrived circumstances and rooting its conflicts and resolutions in relatable everyday occurrences. Perhaps that’s just not possible after seven seasons though, because it’s clear that Modern Family is struggling to keep things grounded week after week. That’s evident in the way the show keeps pumping out storylines revolving around the least interesting parts of these characters. Gloria’s sauce endeavour has been limp in terms of comedy and drama all season long, in large part because the show only chooses to acknowledge that subplot every now and then. There’s no consistency, and that means that every time there’s an episode focused on Gloria’s new business, it feels out of place and hard to care about. The same can be said of Claire’s closet work. This season hasn’t really given us a sense of Claire at her new job outside of a few scattered, but meaningless insights. For the most part her work life is just an extension of her home life. This is the same Claire but in a workplace setting. There’s no sense of change, so when she finds out that Jay has been spying on her through Ben, and that he wants to do a little part time work to help her out, the resolution hardly feels revelatory or interesting. It’s just…there. If the show doesn’t bother to portray its characters going through any sort of angst or difficulty, the resolution falls flat. At least there’s a little spark in Cam and Mitchell’s pseudo-friendly prom competition. When Luke asks his uncle Mitch to help him with a promposal (ugh, that word), Cam naturally feels left out, largely because he never went to prom himself. So, his solution? Convince Manny that he needs an elaborate promposal as well, allowing him to indulge in doves and backup dancers. Things go off the rails when Manny’s first choice already has a date, and then again when his second choice just straight up asks him to go to prom. That leaves Cam without a creative outlet until Mitchell asks him to help out with Luke’s promposal and go to the gym with a note and wait. That leads to Mitchell surprising Cam with a promposal of his own (as chaperones), a genuine, low-key sweet moment that leaves an impression on Cam. It’s the kind of moment Modern Family used to churn out with some regularity. It’s a small moment, but one that has deep meaning, forging more of a bond between Cam and Mitchell. As sitcoms age they have a tendency to get complacent, and that often results in characters turning into shells of their former selves. Small moments like Mitch’s promposal serve to make sure the spark and personality in the characters is still there. That keeps audiences invested and the show feeling fresh and vital. 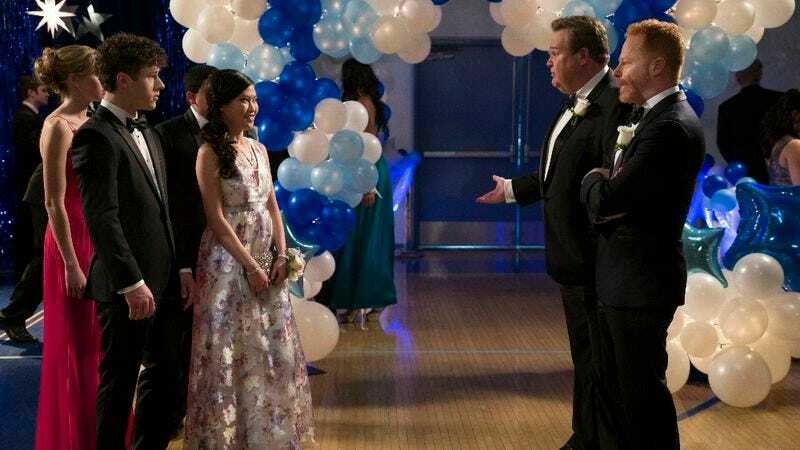 Sadly, it’s really the only moment in “Promposal,” outside of Phil’s fantastic real estate takedown of Auntie Alice, that feels like the show Modern Family used to be. Okay, Phil’s “Snappy” song made me laugh.